One year ago today I was diagnosed with Celiac Disease. Wow, how my life has changed in the last year! I wanted to come on here and share my thoughts about what the last 365 days has meant to me, both the good and the bad! I couldn’t do this without my husband who is beyond supportive of me. Brian didn’t hesitate for a moment when we discussed having a completely gluten-free kitchen in our home. He only orders gluten-free when we are out at restaurants; he doesn’t even drink regular beer anymore (well, except for that one time on vacation when I snuck away for a massage). 😉 He never, ever complains. Nearly every day he tells me how proud he is of me for embracing my new life and making positive changes to stay healthy. Believe me, I realize how lucky I am to have him. Even though they don’t quite understand everything yet, my kids are so sweet about it. Lucy always asks if something is gluten-free so that I can have a taste of her food. It’s so cute how she says “gluten-free” – so pronounced. They still get to eat regular food at restaurants and they are so careful to not touch my food when we eat out so that I don’t get sick. If they ask for something when we are at the grocery store, I simply tell them we can’t have it in the house because it has gluten in it. Thank goodness there are lots of good gluten-free alternatives for us to buy. The more time that goes on, the more UNcomfortable I am with eating out. I didn’t think I’d be this way, but my experience and education about the risks of eating out grows everyday. That makes me feel like nowhere is safe! We used to eat out all the time; we were “foodies” of sorts. Sometimes I feel like maybe I’m not being invited to things because people think it’ll be too much work to figure out food for me. In reality, that’s probably all in my head. And I feel like such a burden when I go out with friends (most are incredibly understanding and supportive) because we are more limited on the choices of restaurants we can go to. I wish I didn’t have to ask so many questions and make such a big deal out of what I’m getting to eat, but it’s necessary and I’ve got my spiel down pat. I wish I could just throw whatever I wanted in my cart at the grocery store. Instead I have to scour the labels to see what ingredients are in everything. That is, if I can pronounce them. Then I also need to find out if the item is processed in a facility with other gluten products because then the risk of cross-contamination increases. Everything is just more work! A lot of people don’t understand what Celiac Disease is or how serious it can be. I had someone say to me once, “Well, it’s not like you have cancer.” Um, yeah, that’s true. But did you know that being in a chronic state of inflammation (like what Celiac causes) can actually lead to certain types of cancer? This is an autoimmune disease, which means that my body is attacking itself. Specifically when I eat gluten, my body creates antibodies that attacks and damages my small intestine and that leads to a whole myriad of other issues. There is no in-between with this disease – you either have it or you don’t. It won’t ever just go away. But I can keep it under control by eating a 100% gluten-free diet. And no, I don’t want to ever have “just a taste” of regular pasta or cake or something. I’d get so sick. It would be taking a huge step back from all the work I’ve done to heal myself and get this far. I hear this next comment a lot: “It’s a good thing you were diagnosed now and not, like, 10 years ago because there are so many gluten-free options out there.” VERY TRUE. Typically, I respond by explaining that it definitely is easy to eat gluten-free. There are so many restaurants with gluten-free options and most grocery stores have lots of pre-packaged goodies. I can’t eat french fries that are cooked in the same fryer as chicken tenders or beer-battered fish. Most places don’t have a dedicated fryer. I can’t kiss my kids if they have eaten gluten and it’s on their lips. I can’t wash my hair with shampoo that has gluten in it because I am worried about the shampoo running into my mouth in the shower. I can’t wear lipstick, makeup, sunscreen, or body lotion with gluten. I can’t take certain medications because they have gluten in them (I’m talking to you Advil Liqui-Gels). All day long I’m thinking about gluten, gluten, gluten, and then some more gluten. I didn’t mean for this to be a rant of the all the things I can’t do. There are also a lot of things I can do! Thanks to modern medicine, I was able to find out exactly what was wrong with me. Food that I choose to put in my body is literally the medicine that is healing me and preventing me from getting sicker. I have been so incredibly fortunate to meet supportive, fun, intelligent, kind, and amazingly interesting people on social media, specifically Instagram. I have met people from all over the world – how cool is that?! I’ve become a much better cook and baker because I spend so much more time in my kitchen. It’s fun! It’s a lot more work, but fun! Celiac Disease has given me a purpose outside of being a mother. The kids take up so much of my time and energy that I feel like I’ve sort of lost myself along the way. This disease has become my passion and it makes me want to be better at everything I do. I love to find new gluten-free products and restaurants around town. And I love to share my knowledge with others! What do I hope this next year brings me? The last year has had its struggles, but it has also been very empowering at the same time. I have had some days and experiences where I feel really sorry for myself. Other days that it feels so awesome to know that I am in control of what makes me feel good – the food I choose to put in my body. I’m not perfect. I still eat some junk food and don’t get nearly as many fruits and vegetables as I should. My major in college was in Food and Nutrition/Dietetics. I didn’t complete my schooling to become a Registered Dietitian, which was my original goal. Everything has come full-circle in a way now that I am back to educating myself every single day about food and how it works in my body! I want to continue to help people by really working hard to create, test, and post gluten-free recipes to my blog (and working on my food photography skills in the process). I have a secret little project up my sleeve with a dear friend who also has Celiac Disease. And I hope that I can guide people who are newly diagnosed and looking for some direction on how to live their best Celiac life in the Twin Cities. I’m no expert, but I don’t think there is a better educator than someone who is living this lifestyle. I am proud of who I have become over the last year. If you are reading this, THANK YOU for being a part of my journey! P.S. I couldn’t think of a good image to go along with this post. 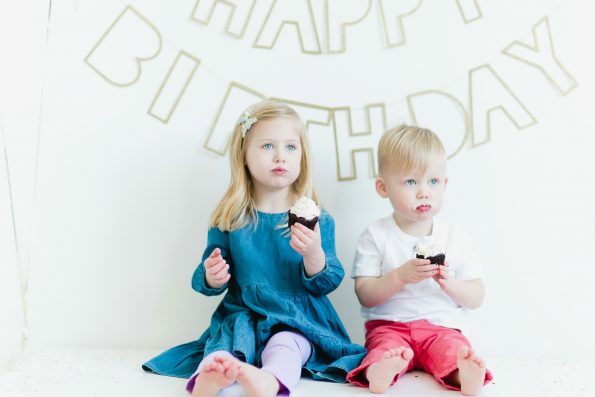 So I’ll just share a photo of my cute, shoeless, blue-eyed babies eating gluten-free cupcakes! Photo by the incredible Gina Zeidler! I am so glad that I found your blog. I can relate to almost all that you said in your post and it’s been 9 years since my diagnosis. I hate always having to choose the restaurant and feeling like a “burden” to those that might invite me over. I’m not sure that ever really goes away especially with my tendency to be a people pleaser. Hi Jenn!! I am a total people pleaser, too – I get it. Food plays such a big role in socialization and connecting with other people. I’ve learned to always have a variety of nutrient dense snacks in my purse at all times and I usually eat before I go out…just in case something goes wrong and I’m left starving (hangry – no one likes hangry ;)). Thanks so much for your note!